Turk’s cap lily is the tallest of the native American lilies, typically growing 4 to 6 feet tall and is native to eastern North America in wet meadows and moist woods from New Hampshire south to Georgia and Alabama and. Leaves are lance-shaped up to 6″ long arranged in whorls around the stems. Downward-facing, nodding, Turk’s cap-type, orange flowers (2.5 to 4″ wide) with greenish throats are densely-spotted with maroon. Sepals and petals are sharply-reflexed and curve backward to touch at the stem thus forming a “Turk’s cap”. Flowers appear in a loose inflorescence atop upright stems in early to mid-summer. 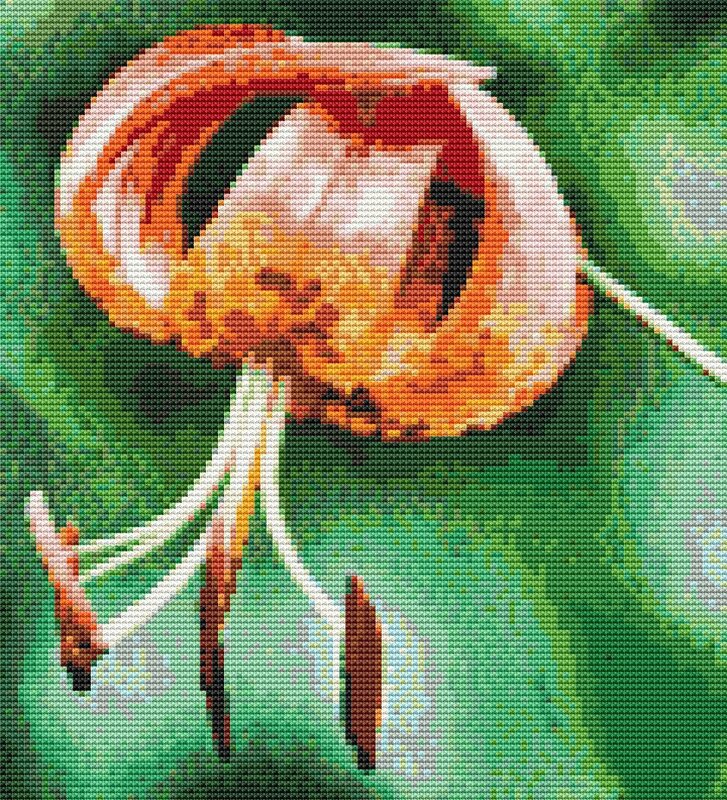 This cap lily is 120×132 stitches and contains 40 colors. It will be fun to stitch, with a bright and vibrant outcome. I’m excited to offer to you. The original photo was taken by the National Park Service, so it is in the public domain.